The SEIU held a rally yesterday in Denver. It was your typical afternoon rally. El Marco posted several photos. Ann Coulter wrote about the current union controversy today. …It used to be widely understood that collective bargaining has no place in government employment. In 1937, the American president beloved by liberals, FDR, warned that collective bargaining “cannot be transplanted into the public service.” George Meany, head of the AFL-CIO for a quarter century, said unions were not appropriate for civil servants. As recently as 1978, the vast majority of states prohibited unionization of government employees. The unions must be desperately hoping that no one will notice … Wait a minute! WE’RE TALKING ABOUT TEACHERS! This isn’t the Discovery Channel’s “Dirty Jobs” — it’s Mrs. Cooper’s seventh-grade “values clarification” class. With heavy union dues, labor has plenty of money to pay for propaganda and to threaten and bribe politicians. On his first day in office, the Republican governor of Indiana, Mitch Daniels, signed an executive order denying public sector employees the right to bargain collectively — something that had been granted, naturally, by a Democratic governor. As a result, Indiana government employees instantly got to take home an extra thousand dollars that no longer went to union dues — and good employees started getting raises, while bad employees got cashiered. But government workers think the job of everyone else in the economy is to protect their high salaries, crazy work rules and obscene pensions. They self-righteously lecture us about public service, the children, a “living wage” — all in the service of squeezing more money from the taxpayer to fund their breathtakingly selfish job arrangements. There’s never a recession if you work for the government. The counties with the highest per capita income aren’t near New York City or Los Angeles — they’re in the Washington, D.C., area — a one-company town where the company is the government. The three counties with the highest incomes in the entire country are all suburbs of Washington. Eleven of the 25 counties with the highest incomes are near Washington. For decades now, the Democrats have had a good gig buying the votes of government workers with outrageous salaries, benefits and work rules — and then sticking productive earners with the bill. But, now, we’re out of money, no matter how long Wisconsin Democrats hide out in Illinois. More… Reason Magazine added this on the current fiscal crisis. …The specifics of the Wisconsin fight aren’t why it’s so important. Collective bargaining rights for public unions may or may not be the right battlefield on which to settle a state’s fiscal future. But Republican Gov. Scott Walker is showing a long-term sophistication, beyond the specifics of this fiscal year’s bottom line, in trying to limit the growth of government spending by preventing collective bargaining by public sector unions. Such “bargaining” is often a charade where both sides support each other financially at a third party’s expense (the taxpayer, that is), as is often the case between public sector employees and politicians. It’s likely not essential to the survival of Wisconsin that Walker win this fight. As his enemies point out, cuts could happen in other places, taxes could be raised. Still, a loss would be an unsettling sign for how America’s political class (including the vocal voters and media professionals that move them) is prepared to face a depressing fact we’ve been explaining to you here at Reason for a while now: We are out of money, on both the federal and state level. Wisconsin is an early sign of the stresses that will either shift our system of government action and spending to something unrecognizable to those who lived in the post-WW II boom years or tear that system apart. And everyone seems ready to fight about this necessary shift. The White House has its hands in. 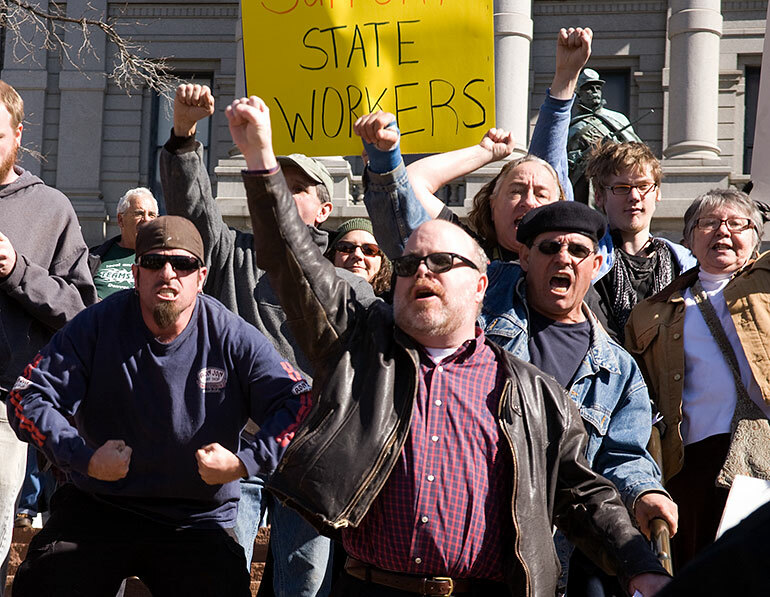 The AFL-CIO is reviving the old anarcho-syndicalist dream of the general strike to show that all labor is feeling the pain of Wisconsin’s public unions. People all over the globe are delivering pizzas in solidarity. Both sides of the larger debate about government spending are busing in their forces. Progressives are calling for national anti-austerity protests this weekend.